Summer is most definitely with us! Hot, humid in Oklahoma due to the incredible rainfall amounts we’ve had. But summer also means lots of vegetables in season. Vegetables that can be purchased from local farmer’s markets, grocery stores – some of which carry local produce – friend’s gardens and even your own garden. So many yummy vegetables! Sometimes, however, it’s get tiring eating them the same old way. I have to say that the heat in summer kind of takes my appetite away. In today’s post I’ll share a recipe that I found several years ago. It’s light, tasty, uses lots of vegetables and doesn’t heat up the kitchen! The recipe is for vegetable burritos with corn, tomato and cilantro slaw (which I’ll share next week). The nice thing about this recipe is it’s flexibility. If you don’t like zucchini, use patty pan squash. If you don’t like mushrooms leave them out. Out of beans in the freezer to smoosh into refrieds, add them in next time. The recipe originally called for the mushrooms to be marinated before roasting. I happen to love them sautéed in butter so why bother with that step? To make things simple I chop, slice or snap whatever I’m using first. Using a large skillet I add what takes the longest to cook and then add other vegetables that cook more quickly. If part of it gets done and I’m not through, I’ll dump those into a bowl and then continue on. These work well for leftovers in my opinion so there’s a bonus! Since the vegetables have been sautéed in butter, olive oil, or coconut oil or a combination it’s so easy to reheat. Heat up the skillet and dump in the amount of vegetables that you need. When they are warm enough to your liking they are done! Tortillas of choice – corn or flour. My favorite brand of corn is Food For Life – their sprouted, organic tortillas are wonderful. For flour I make my own spelt tortillas. Butter, olive oil, coconut oil or a combination. Grill, roast or sauté vegetables starting with vegetables that take longer, such as onions, green beans, and squash. Add mushrooms toward the end. Heat tortillas briefly in the oven. 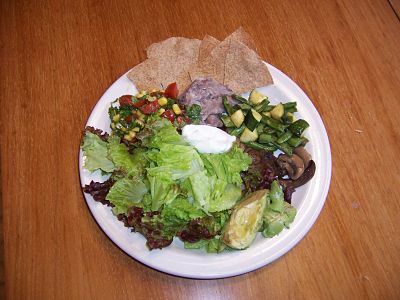 Build tortilla beginning with lettuce, adding beans, vegetables, guacamole, or avocado. Add corn, tomato, cilantro slaw.